NYC-based Percolate has raised $9M led by GGV Capital. Percolate raised $1.5M in seed funding last year from First Round Capital, Lerer Ventures, SV Angel, Transmedia Capital, Advancit, Dave Morin and Rick Webb. Enthusiasm for the company comes both because they have some traction with brands that are paying real money, but also because other startups in this space have been bought up at significant valuations. The company sells brands a $120K per year package where they help the brands to Tweet and post to Facebook thoughtfully. 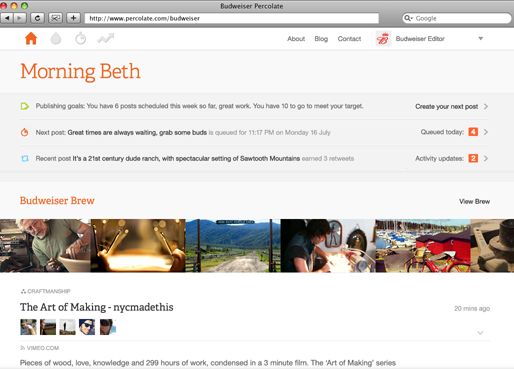 Percolate seems to benefit from brands that do boring posts. Percolate helps them by following related users to see what they are thinking about so that the brands can post content that is part of that conversation. On top of the screens, they have project managers that take in this work and to Tweet and post on behalf of the brands. We see it is akin to hiring a PR firm to manager your relationships with the media. The startup was founded by Noah Brier (previously with the creative agency The Barbarian Group) and James Gross (who was with Federated Media).